Are you a morning person? I’m not. I’m a total night owl and love to stay up late. Working on my blog, watching that latest episode of Downton Abbey, or cuddling on the couch with my man. I just despise waking up early. Totally not my thing. I may (sometimes) wake up grumpy, but you know what always cheers me up? Making a yummy breakfast for my family! 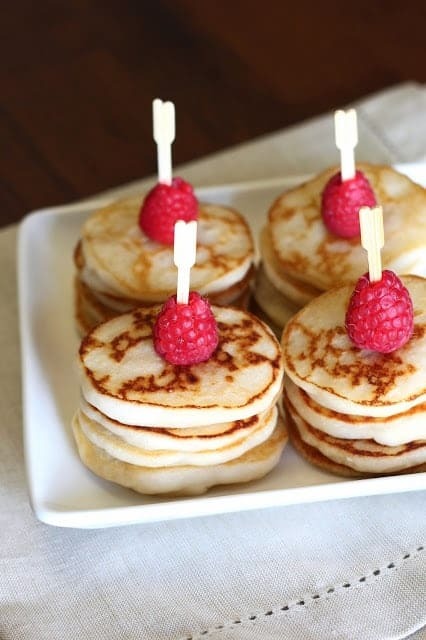 These mini lemon pancakes are almost too cute for words. 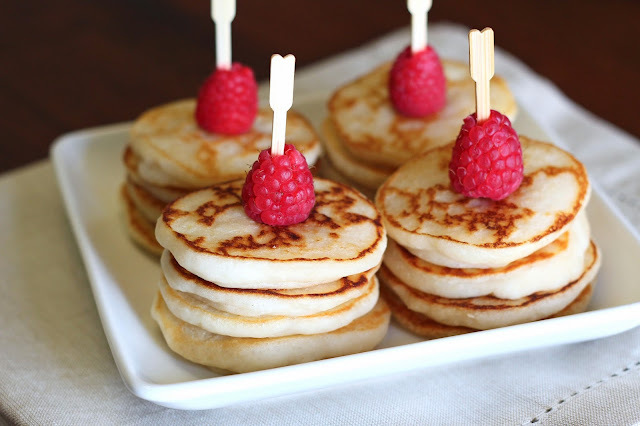 I’m already a huge fan of pancakes of any kind, but make them tiny…just stop it. I’ve accepted the fact that every treat becomes irresistible when it’s in it’s tiny form. Mini cupcakes, mini cheesecakes, bite-size cookies, brownie bites. I just can’t say no. I also can’t stop myself at just one. Back to these adorable pancakes. They are gluten, dairy, egg free and so fun! I added fresh lemon juice and lemon zest because, well, I love all things lemon. 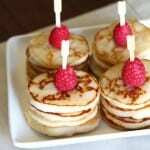 The pancakes are so light and fluffy and get nice and golden from the coconut oil. This batch makes quite a few, but they freeze and store quite well. Great to make for school mornings too. My kids love them with either peanut butter, fresh berries or pure maple syrup. I’ve decided to enter these little guys into the Fast and Fresh Dairy Free Time Trials recipe contest, sponsored by So Delicious over at Go Dairy Free. Quick, easy and already a winner in my book! In large mixing bowl, whisk together flour, baking powder and salt. Set aside. In medium bowl, mix together coconut milk, melted coconut oil, maple syrup, lemon juice, lemon zest and vanilla. Add the wet mixture to the flour mixture. Whisk until just combined. Heat large skillet over medium low heat. Coat with cooking spray or a tablespoon of coconut oil. Add a heaping tablespoon of batter to the pan. Flip pancakes after about a minute, when golden brown on the underside (they cook quickly). Continue to cook on other side. Repeat with remaining pancake batter. Serve warm. This entry was posted in Kid Zone, Main Dishes, Recipes, Recipes & Techniques by Cooks We Love, Vegan and tagged autism diet, autism gluten free, autoimmune disease, breakfast, celiac, celiac disease, celiac health, food allergies, g-free, g-free diet, G-Free Foodie, gluten allergy, gluten free, gluten free baking, gluten free cooking, gluten free diet, gluten free food, gluten free mommy, gluten free parent, gluten free parenting, Sarah Bakes Gluten Free Treats. Bookmark the permalink.